There is no single body type that indicates a competitor will be successful in boxing. The history of the sport shows great success for tall boxers with long arms, shorter boxers with more powerful physiques and athletic boxers who can generate speed and power. Boxers who are taller than their opponents and have athletic builds have an excellent chance to succeed in the ring. When a taller fighter who has long arms can establish his left jab, he can dictate the pace of the fight. A crisp left jab may be the most important punch in boxing because it can stun the opponent when it lands cleanly, and it can also set the opponent up for a series of punches. Having longer arms helps a boxer establish his left jab while staying clear of his opponent's reach. Boxers who are swarmers -- former heavyweight champion Mike Tyson, for example -- tend to be more muscular and powerful. This type of fighter is willing to accept a punch or two so he can get in a series of hard punches. A swarmer is relentless in his attack. He is trying to use combinations to hurt or knock out his opponent. A powerful and muscular build will help a fighter cause the most damage when his series of punches connects. 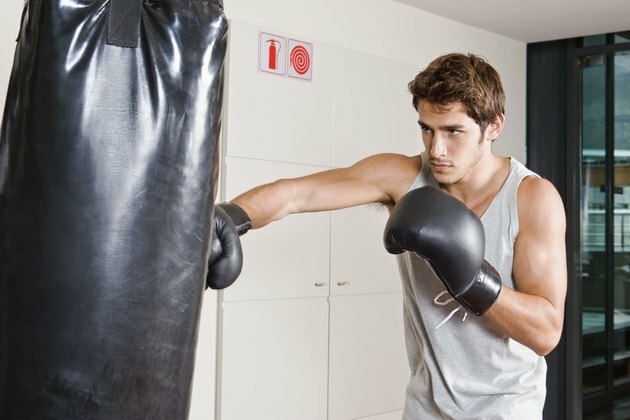 A thin boxer may not seem imposing when he enters the ring, but if that lack of girth is accompanied by overwhelming quickness, that body type can make for a successful boxer. Fighters who depend on speed often manage to avoid getting hit with damaging punches. This can frustrate an opponent who's expending significant amounts of energy to throw punches but repeatedly fails to connect. The thin and athletic build allows the boxer to use his conditioning to take over a fight and seize control of the pace. A boxing theory stated by Leandro Solis on Bad Left Hook.com indicates that fighters who are "large-boned" have an advantage over competitors. While this is a nebulous term, Solis used wrist size as an indicator of having bigger and stronger bones. Solis' theory says that a big-boned fighter can take a punch better than a competitor and deliver a harder punch. A bigger wrist is often an indicator of a bigger hand that can deliver a more powerful punch and a larger chin that can absorb one. Solis used wrist measurements of dozens of fighters in several of the middle weight classes, and it was not surprising that champion boxer Manny Pacquiao had the largest wrist of the competitors measured.